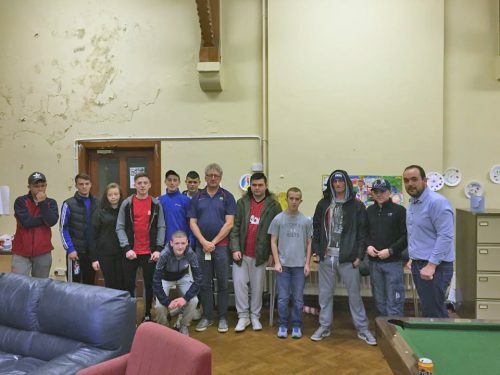 New Lodge Youth Centre is a voluntary youth centre based in the Greater New Lodge area of North Belfast. The youth centre moved from BELB management to Ashton Community Trust community management in April 2012. Since then we have worked hard to increase programme delivery and maximise the overall potential of the Centre by ensuring greater accessibility and usage by local young people. We provide a range of programmes for young people during the week and at the weekend that are designed to help them grow and develop. Sports development, e.g. football, pool, team games, swimming. Street Outreach: Staff and volunteers from New Lodge Youth Centre also facilitate street outreach in partnership with other agencies. 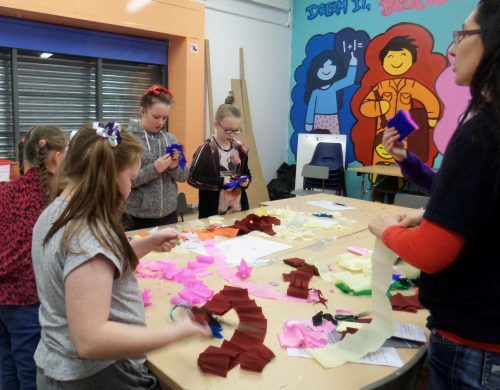 Ashton Community Trust, through the New Lodge Youth Centre, works to create appropriate settings that facilitate the growth and development of the young people of Greater New Lodge. We work in partnership with young people to meet their needs and aim to create an environment of mutual respect and understanding, equity, diversity and interdependence. The Youth Centre provides young people with the opportunity to grow, develop social and life skills in a safe and secure environment, take on responsibility and make decisions on their own based on sound information and support. We also work with other youth and community groups throughout the city to build relationships that provide additional opportunities for young people to learn and gain a greater understanding of the needs of others. We educate young people through informal methods, addressing issues that affect their lives and development. Our work starts from where the young people are. We seek to expand young people’s horizons, promote participation and invite social commitment, in particular by encouraging them to be critical and creative in their response to their experience and the world around them. I started taking part in projects in the New Lodge Youth Centre in the summer of 2012 when I was 12 years old. I started to get involved in a youth group with other young people my age and for the next three years it led to what was to become the most exciting time of my life. Cross community projects became a part of everyday life for me. One of my favourite programmes was ‘Tell Me Your Story’ where young people from the Hubb Community Resource Centre on the Shore Road and young people from the New Lodge Youth Centre told their stories about growing up. It was amazing to listen to young people from another community who had the same issues growing up as we did in the New Lodge. I have gained many life skills in the New Lodge Youth Centre and have taken part in many OCNs such as Level One in Law and Order, Level One OCN Youth Leadership and Level One OCN Peer Mentoring. The skills I have developed will help me over the coming years. I have also been involved in numerous residentials at home and abroad. In August 2015 I took part in a project called ‘Motivational Compass’ with young people from North Belfast and Holland. The project taught me a lot about myself and helped me believe that I can achieve things I didn’t think possible. I love my time at the Youth Centre and I want to gain more qualifications and improve my lifestyle. The centre has been a big part of my life. Before I was introduced to the New Lodge Youth Centre through the street outreach team, I passed my time knocking about the streets with a football trying to take part in any activity I could. As soon as I stepped into the New Lodge Youth Centre it was like a breath of fresh air and I realised it was something me and my friends could do in the evenings. As I gradually started to feel more comfortable I began to take part in activities the youth centre was running and after each session, my confidence grew and I grew as a young person. The Youth Centre then offered me the opportunity to travel to the Swiss Alps with the Hubb Community Resource Centre on the Shore Road as part in a cross community initiative. When I arrived back home, I started to go to the Youth Centre more. I had a new enthusiasm and spoke to staff about an idea I had on raising awareness on homelessness in Belfast. We came up with the idea to do a major sleep out with all youth centres in Belfast at the City Hall. It was an amazing experience and gave me a very brief insight in to what life is like for people who are homeless. I was also involved in the ‘Challenging Stereotypes’ group. I learnt a lot in this programme and probably more than I ever learnt in 11 years of education in school. I also learned the ropes in youth work and began to realise I would like to choose youth work as a chosen career path. I was awarded an OCN on working with young people with disabilities through the 174 Trust and also achieved my 50 hours Millennium Volunteers Award. I am very proud to have all of these awards as they will stick with me throughout my life. From taking part in these activities my journey has been an incredible and unforgettable one so far. I know this is only the start for me as I feel youth work is the career I want to choose and have taken the next step by starting my OCN level 1 in Youth Work. I am from the New Lodge and started attending New Lodge Youth Centre at the age of seven. As a child I was involved in many activities and projects such as cheerleading and performing arts. When I was growing up I was given many opportunities in the Youth Centre and these inspired me to become a youth leader myself. This would have never have happened without the help of my youth leaders at New Lodge Youth Centre. Once I decided on what I wanted to do, and with the help of the staff, I applied for an OCN level 1 and 2 in youth work. I volunteered for a while in the Youth Centre but I soon found my motivation dipping. As time went on I knew I needed to get back on track and that I needed support to do this. At the age of 23 I still had leaders that saw and knew my potential. They had faith in me and knew that I just needed help. They gave me the confidence and motivation to get back out there to be the person I knew I could be. In 2014 I completed my OCN Level 3 in Programme Development and Working with Others. This was amongst the proudest moments of my life. Since then I have been involved in personal development programmes with young people through the Prince’s Trust. I also won a Community Impact Award with the Prince’s Trust. I am now a member of staff in the Youth Centre. There is only one way forward for me now and that is up and I am looking forward to working with young people from my community to help them realise their potential and get involved in some wonderful opportunities that the Youth Centre can offer.